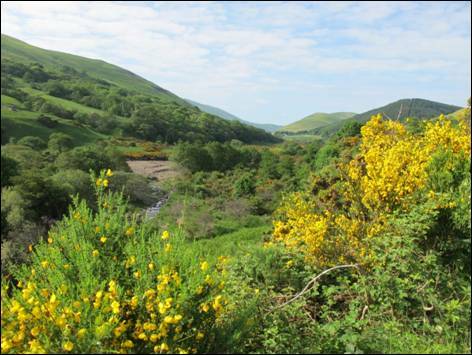 It was April and, with the extensive gorse in full flower, the pencil-straight College Valley was the picture-perfect starting point for a rollercoaster trip to The Schil`s rocky summit. Standing on the English/ Scottish border it is the last significant hill on the Pennine Way for walkers heading north. I parked at the tiny hamlet of Hethpool, close to a row of fine Arts & Crafts style cottages, and then I quickly made tracks for the top of Great Hetha and the site of an impressive Iron Age hillfort. After descending to the white-walled farmstead of Trowupburn I began a long steady climb to the border fence where a sea of green rolling hills filled a widescreen panorama. I speculated on how many Pennine Way walkers might have enjoyed the same intoxicating views on their epic journey northwards. With my boots now firmly planted on Scottish soil and with the Halterburn Valley to my right and the valley of the Trowup Burn to my left, I followed Steer Rig, a superb, grass-covered ridge, gradually upwards to Black Hag. Then, crossing back into England, I began the final, muscle-testing climb to the 601 metre high summit of The Schil. This is a mountain in all but height, lacking nothing in self-belief and with outstanding views towards The Cheviot and the hillside-cutting cleft of the magnificent Hen Hole. I lingered longer than intended, slowly savouring every energy-boosting bite of my peanut butter sandwiches. But time and tide, apparently, wait for no man so I back-tracked, fleet-footed to Black Hag and on to the dome-like Saugieside Hill. This is a modest, infrequently-visited hill which offers isolation in abundance. I tarried awhile, enjoying the gentle, early afternoon warmth, before heading for the tiny walker`s cairn marking the flat summit of Loft Hill. This was my sixth and final top of the day so I idled away a few more minutes appreciating the splendid view towards the craggy Easter and Wester Tors strutting their stuff high above the valley. Reluctantly, with the sun sailing away westwards, I left the high ground and rejoined the College Valley for the gentle 1½ mile stroll back to Hethpool. I wondered whether April really was, as T. S. Eliot wrote, “the cruellest month”!